1: The Zombie Zone is an interactive survival scenario. Customers first watch a safety video. They are then given a paintball gun loaded with 8 paintballs. These guns do NOT use air canisters, but are spring driven and are of a smaller caliber. The paintballs are not going at a speed to mark or bruise. After practicing on targets that are set up on the trail, the customer is then given the opportunity to shoot “human” zombies. The zombies must wear safety helmets, which are provided. 2: After the paintball portion of the trail is over, customers are given Nerf axes, and then sent into our building with a mission to save the world. While the customers are on their mission, the zombies are on their own mission to try and pull clothespins off of the customers. If the zombies get the clothespins, then the customer turns and goes after his/her friends! Our trained haunters supervise the experience closely for everyone’s safety, but this is a physical activity that requires energy from the volunteers! 3: $2.00 from every ticket sold for that night’s Zombie Zone goes back to your group/organization! 4: Groups/organizations must provide a minimum of 15 people to portray Zombies. The ideal number of Zombies to work the Zone is around 20. 5: We supply the zombie clothes and make-up, however you may come already dressed as a zombie. Please NO open toe shoes or heels. 6: The Zombie Zone runs from 7:00pm until 10:00pm on weeknights, and 7:00pm till Midnight on Friday and Saturdays. Volunteers need to arrive as close to 6:00pm as possible for make-up and costuming. 7: A release form must be filled out and signed by each participant. 8: The more customers that attend the Zombie Zone the more money your group makes. With that said, you can help by advertising that your group will be zombies on the nights that you work. We are excited that your group is interested in being our Zombies for the night! Here is some important information on how our Zombie Zone works, and what we ask from our Zombies. Please share this information with your volunteers, if you decide that this is the fundraiser for you! 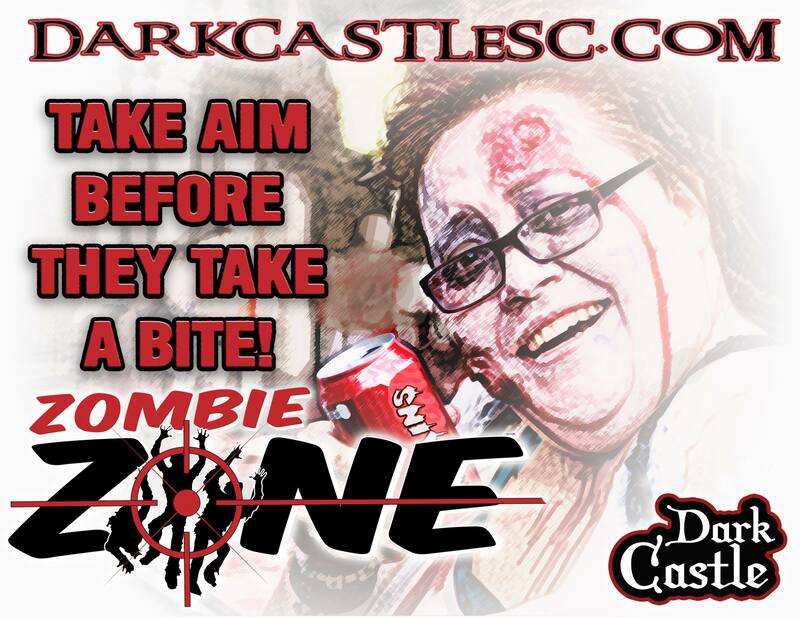 Please call (803) 309-5586, or email us at darkcastlesc@gmail.com today to have your group/organization start making money in our Zombie Zone!